Carrie Jarvis and her team are locally based and personally oversee your dog's holiday experience from booking to return home. We are at hand 24/7 to support our host families so that your dog has all the cosy comforts of home delivered by a professional dog care service. Originally a Barking Mad customer, Carrie understands the importance of finding the right holiday care for your dog and we're proud of our 5 star Trustpilot rating. Our hosts and their homes and gardens are carefully vetted and inspected by us - we're your gateway to a quality service, saving you hours of searching for trustworthy dog sitters yourself. Hosts are always based at home for your dog's holiday and are either retired, working part-time/flexibly from home or stay at home parents. Your dog(s) will be their only guests for the duration of your holiday - we never multi-board dogs from different families. The careful matching process ensures that your dog is looked after by a host who can meet their needs. 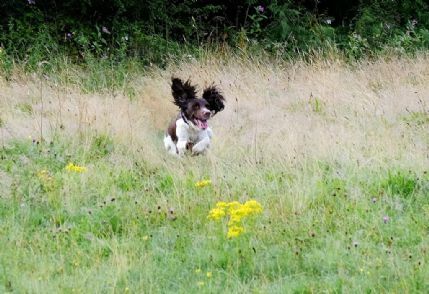 Whether that's a 20 minute walk on-lead or several hours of active, off-lead exercise we have hosts to suit all dogs. The vast majority of our hosts live in the countryside or on the edge of the suburbs with access to lovely green spaces. Our city hosts are all people who love to get into local parks and enjoy days out of town with their guest dogs. We also have adaptable hosts who love to offer TLC to elderly dogs who are no longer exercised. All your dog's routines are followed by our host families using the individually prepared notes provided by us. These are based on our in-depth registration meeting with you and your dog at your home. Not only are feeding, exercise, grooming and sleeping arrangements followed as per your wishes but dogs requiring medication (including injections) are catered for too. Transport £40 per booking - covers collection and return on an individual basis by family car, not van.